Following the successful Bharat Bhandh on April 2, a largely spontaneous Dalit-Adivasi event, the BJP is beginning to show signs of nervousness. Prime Minister Narendra Modi’s decision to ask party MPs to spend at least two nights in Dalit-dominated villages and “restore” faith of the community in the BJP comes close on the heels of the party’s Dalit MPs telling him that the saffron party was fast losing out Dalit support. Modi reportedly told MPs to choose any of the 20,000 villages of India, which have more than 50% of Dalit population for spending two nights between April 14, Baba Ambedkar’s birthday, and May 2. A significant target group for the 2019 elections, the Dalit community forms 16.6% of India’s population. Modi was forced to give the call close on the heels of BJP’s Dalit MPs telling him as well as those who had gathered at the Mumbai party meet that the Bharat Bandh, called in protest against the Supreme Court move to dilute the Prevention of Atrocities (POA) Act, suggested] the party had lost its edge in the Dalit community. Dalit leaders in the party said they had to virtually go to every minister and leaders to convince them that the Supreme Court order would harm the community. Dalits, they said, seemed convinced that the Modi government failed to effectively counter the apex court argument on POA Act being “misused” against innocent citizens. The result was, the BJP was not being seen as a pro-Dalit party. BJP’s Dalit MPs are beginning to show signs of restiveness by writing letters to Modi. 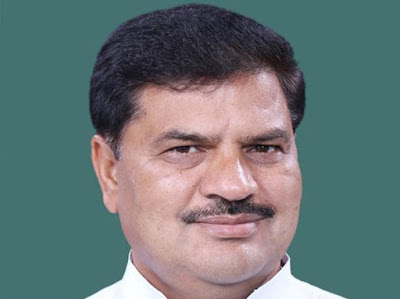 Dr Yashwant Singh, MP from Nagina in Uttar Pradesh, said in his letter that the government has not take any step to implement reservation policy in the private sector, even as insisting that there is a need to increase the proportion of Dalits in the judiciary. Dr Singh’s letter comes following three other BJP MPs – Chhota Lal Khawar, Ashok Kumar Dohre and Savitri Bai Phule – accusing the Uttar Pradesh’s BJP government under Yogi Adityanath and the Modi government for failing to take cognizance of growing atrocities on Dalits. 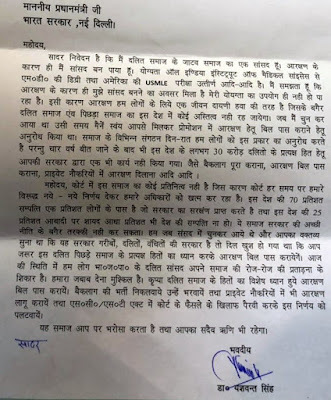 Dalit MP from Robertsganj, Khawar, in his letter to Modi, complained how Adityanath scolded him and asked to him leave his room when he wished to meet him to raise issues of Dalits. Khawar has accused Adityanath of caste bias, and has gone so far as to approach the National Commission on Scheduled Castes with a complain of threat by dominant caste people in a land dispute. MP from Bahraich, Phule organized an independent rally in Lucknow on April 1. The colour of the event was not saffron but blue, with Bahujan Samaj Party founder Kanshi Ram’s portrait in the centre-stage. 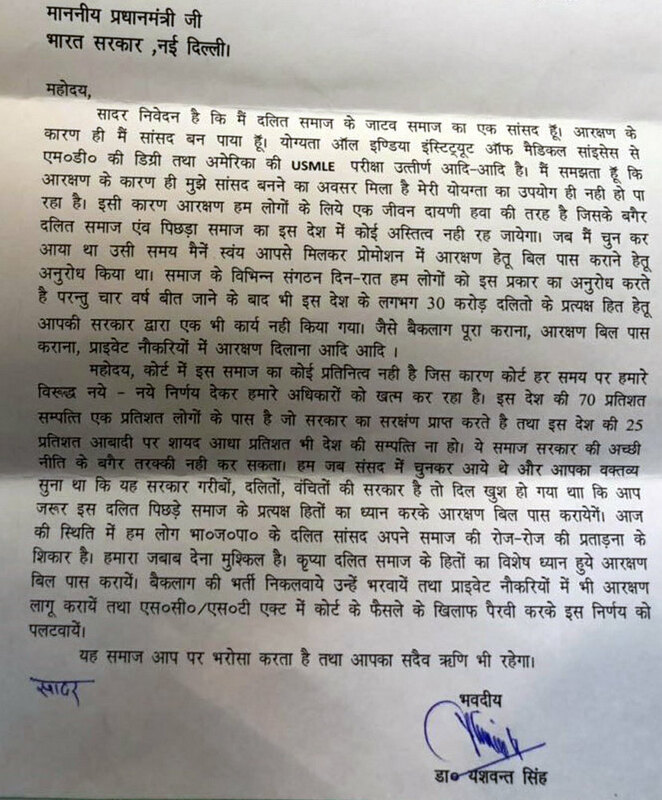 Dohre, Adivasi MP from Etawah, in his letter to Modi, is learnt to have complained against the Uttar Pradesh police, saying it has been increasingly targeting Dalit. According to him, the state police used foul language against Dalits, and registered false cases against them in the wake of the violence during the Bharat Bandh. Phule told reporters, “I am India’s MP and it doesn’t matter if I remain MP or not, but will not tolerate any changes to the constitution and reservation.” The rally was called tSave Indian Constitution and Reservation rally. BJP Dalit MPs are also disappointed that Prime Minister Narendra Modi invoked Ambedkar in his Mann ki Baat radio address on Sunday, but maintained a studied silence on the Supreme Court seeking to dilute the POA Act. "This is a very urgent and important issue. It is the lifeline for SCs and STs. This must be resolved without delay. We will not go on tolerating this," BJP MP Udit Raj reportedly said.